Incredible Mountain Views from Our Village of Loon Townhouse. Relax on the spacious deck while watching the sun set over Loon Mountain. A three story townhouse with 5 bedrooms and a loft, 2 full baths, 2 half baths and two family rooms! Comfortably sleeps 14 - great for families with lots of space for adults and the kids. The cooks in the group can prepare a delicious meal in our well appointed kitchen while the rest enjoy the fireplace from the oversized comfy couch. THE DETAILS: The main level has a cathedral ceiling family room, kitchen and dining area, full bath and the master bedroom with a king bed and a half bath. The upstairs has a queen bedroom and a two-level loft with a queen bed and a set of bunks - each on a separate level. The lower level has a second family room with kitchenette, fireplace and full-walkout, queen bedroom with a half bath and a bunk room that sleeps four and a full bath. 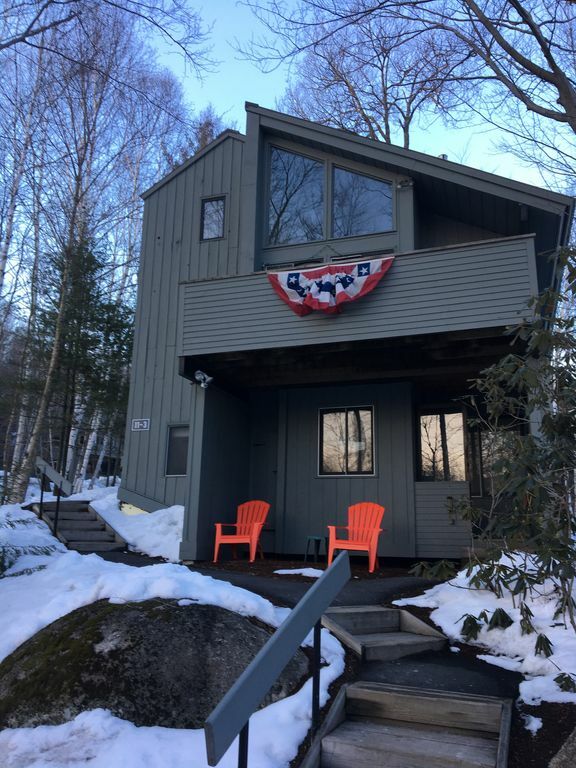 This well-maintained property can easily accommodate 14 people - And to top it off, the babbling brook outside your windows will lull you right to sleep after a long day of hiking or snow sports! Our unit has full access to the Village of Loon Swim and Tennis club. The facility has 2 outdoor and 2 indoor pools, both with adjoining hot tubs. A fully equipped weight room ,12 tennis courts and a game room for the kids! Check out the web page for The Village of Loon/about the resort...you an see images of Swim & Tennis facility. Our family has been skiing and hiking in the White Mountains for the past 20 years. We love the location! Door to door in an hour and 40 minutes! We bought our condo at the Village of Loon because of the people who live and work in the Lincoln community. The Village of Loon has that Village feeling, quaint, active and one with nature. This property was perfect for our family summer vacation! The condo was clean, spacious, great location and access to the Loon Mountain Club (pools etc). The owners were very kind and helpful and the communication with them was great! We hope to come back next year! Sue D.
Thank you for your review! It was a pleasure having you in our Loon vacation home! We'd love to have you stay with us next year as well! The layout is a little awkward, but worked for our family. There’s room for all to gather yet enough separate levels to ensure privacy. I recommend this highly for two reasons. The owners’s accessibility and location. Terry saved my family’s vacation!! We were the unfortunate party of an alleged overbooking at another property just one week from our ski vacation with 14 people. Terry answered our request quickly and we booked the next day I believe. The location of the townhouse can not be beaten. It was large and was comfortable for all our crew. All instructions were easy to follow We are still talking about the trip and are taking about going again next year. We just returned from an annual family ski weekend and of the 3 different properties we've rented at Loom Village this one was the best. Plenty of room for the 10 of us and loved that there were 2 baths and 2 half baths. The fireplaces made the house cozy and we could hang out on either level. Views of the mountain were fantastic. Only one drawback - The closets and dressers had things in them (lamps, mirrors, blankets, etc) so you couldn't really unpack your bags. I like to unpack rather than work out my bag for a few days but that's my personal preference. It wouldn't deter me from renting here again. We had a great stay at the Village of Loon. Townhouse was clean, comfortable and spacious. All the comforts of home! Owners were very accommodating. Highly recommend! We enjoyed a family vacation over the New years holiday (2014/2015). There were 12 of us...6 adults & 6 kids. We never felt crowded and privacy was never an issue. The condo is well supplied and felt like home. Very comfortable! The Loon Mountain area has much to offer everyone. Skiing, tubing, zip lines and more. Great restaurants and shopping too! The owner is very friendly and helpful. She made the whole experience easy and fun! We'll be back!